Interview conducted by Joseph S. Hopkins via e-mail over the course of January 2017. 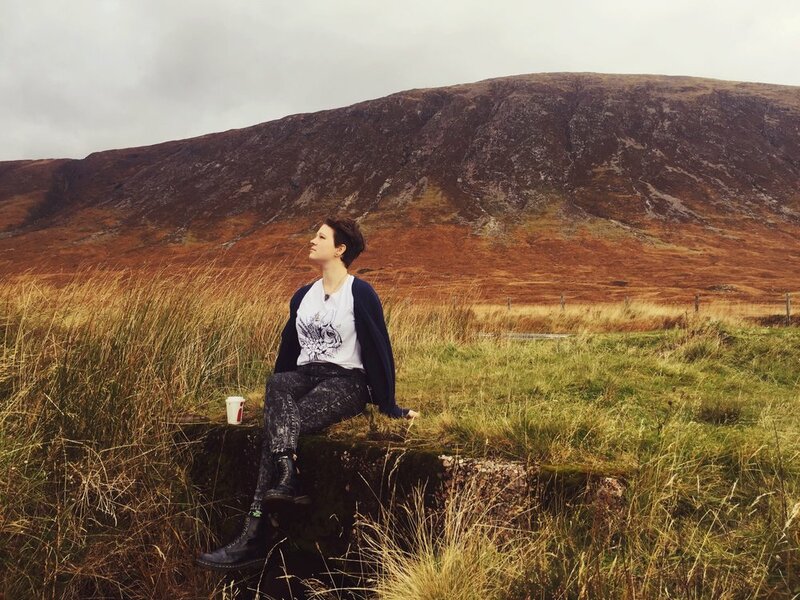 Kjersti Faret in the Scottish Highlands, Fall, 2016. Image provided by Faret. Kjersti Faret, Mimisbrunnr.info's eleventh Six Questions subject, is a New York-based American artist. Faret primarily works with printmaking, illustration, and embroidery, and often draws from her Scandinavian heritage for her subject matter, reflected in her pieces depicting entities and narratives from Norse Mythology (Faret's portfolio can be seen here). Faret makes her designs available by way of her lifestyle brand and online shop, Cat Coven. 1. Where did your grow up? Since I'm half Norwegian I grew up with a strong Nordic heritage. But it wasn't until college I actually read the myths. It was a personal venture as I was searching to go deeper into my roots. Freyja rides her cat-drawn wagon in Kjersti Faret's Queen of Cats, digital/screen print, 2015. I still feel like I'm figuring it all out but the path I'm on is pagan. I identify as a solitary witch. I like the idea of gods and goddesses but right now I view them more as archetypes that help on meditation journeys, etc. A Viking Age ship in the distance, Jǫrmungandr, the great serpent, writhes from the sea and encircles a skull bearing the rune *mannaz in Kjersti Faret's Migard, digital/screen print, 2015. Nope. I have a few friends who do though (they did or are doing a Viking/Medieval studies program in Iceland) so I'm having them recommend me books or I just look at reviews of books online and pick which ones fit my needs. I'm attracted to it very strongly, I think, because I have a strong family heritage with Scandinavia. That means the pagan and magickal path I'm on is heavily influenced by that which translates into my creative endeavors. My artwork is mainly about all those spiritual ideas and creating is my way of processing and fully exploring those ideas. Joseph S. Hopkins would like to thank Kjersti Faret for her participation.